Why did I decide to eat more wholesome foods? Why did I decide to eat clean more? The are many reasons. I honestly didn’t fully realize the truth behind food additives and commercial foods till very recently, although I knew about them on the surface for a long time. It wasn’t until I started reading food blogs that I really got myself in the right mindset. About the time I started reading food and health blogs, I read the book “The Kind Diet.” While this book focuses on veganism, it taught me a lot about food in general. I am not vegan, but I have done a vegan challenge before which allowed me to notice how much dairy I really eat on a daily basis. Over the weeks, I realized how bad processed foods are – white sugar and flour. Ever since it got stuck in my head, I’ve been focusing on not using these ingredients for myself. I find that every time I eat something processed, something with a lot of white sugar, it never fills me up. I will be hungry again almost immediately. My stomach will not notice the natural fullness feeling I would otherwise feel if I was eating unrefined foods. This became especially noticeable for me on the day I made chocolate pb&j cupcakes for my ex-roommates graduation. While I was excited I found a way to get rid of some of the refined flour and sugar which I wasn’t normally using, I absolutely had some of the outcome. The outcome was good… However I had one and a half of cupcakes. It didn’t fill me up. I wanted more food. I went for a panini but I also started craving something salty. An hour after, I started craving something sweet again. This time I decided to have some chocolate-covered yogurt bites. So good. Healthier, this time. But while the cravings lessened, some still remained. It was a huge struggle to resist all night. Really difficult. I’m entirely sure that these refined processed cupcakes were the culprit to awakening my cravings. I knew this is why. In addition, I felt tired and groggy. My joints hurt. Coincidence? Or am I just noticing this now? I’m happy that I realize that this is a problem. I’m glad that I understand the causes of the cravings. And this serves as reinforcement for continuing my clean and healthy eating habits. I never want to have such strong cravings again – they are destructive and they are horrible when it comes to returning back on track afterwards. I will make sure to resist temptations and will make sure not to indulge in processed foods very often, only on special occasion when there aren’t any healthier options. I just can’t wait to get rid of my white four and sugar. I don’t want to throw it out though… What to do, what to do? Remember how much I raved about the Balance Bars in my Energy Bar Wars post? Yeah, I’m such a huge fan. I think these bars are actually my favorites. 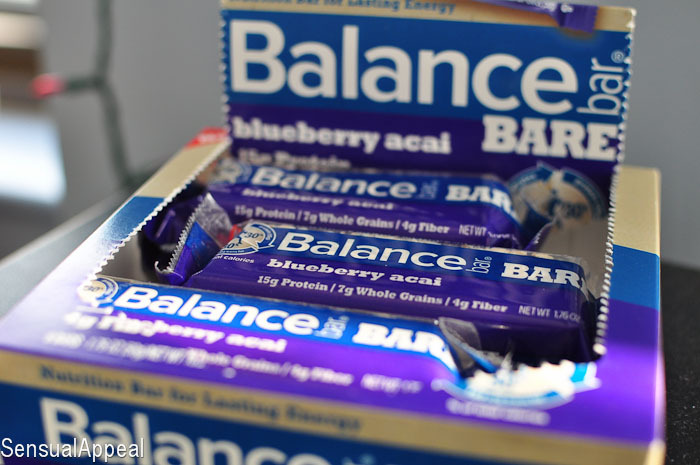 But I had no idea that the Balance Bar came out with a new line – Balance Bar BARE. Because I was already a fan of the original bars, I was super excited to try these babies out. Similarly to their original bars, these go along with their 40-30-30 model – 40% healthy carbs, 30% quality protein, and 30% dietary fat (% of total calories). This model helps stabilize blood sugar levels, satisfy hunger and provide energy. The flavor I got to try, Blueberry Acai, are their newest flavor addition. The bar has 200 calories and has wholesome ingredients and is sweetened with organic agave and brown rice syrups. Let’s bite into it, shall we? The bar has a yogurt bottom and an oat top. Some of the top crumbled off, with some oats falling off – I see this as a good sign. This shows me that this is a natural bar, made with truly real ingredients rather than getting slathered in some binding agent. The flavor is mild but prevalent. The blueberry flavor is subtle but noticeable. The texture is in between chewy and texturized. It has a nice sweet taste which isn’t overpowering. Yes! It’s difficult at times, but I feel like as long as you leave the cooking to yourself then it’s not hard at all. Thank you for reading! I’ll look for these bars.. I have the same problem with sugar.. even a wee sprinkle on my healthy oatmeal has me craving sugar all day! !